Call of Duty®: Black Ops II is a First-Person Shooter (FPS) that revolves around unique gamepaly that propels the Call of Duty® franchise into a world of future warfare, and back again to the modern era. 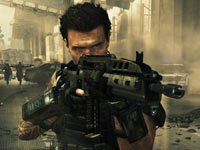 The game is a sequel to the 2010 release, Call of Duty®: Black Ops II, and features returning Black Ops characters Sgt. Frank Woods and Agent Alex Mason, joined by a wealth of new characters. Additional features include: two distinct yet linked playable time periods, advanced weaponry, branching storylines created by player choices in Strike Force missions, exciting multiplayer options, and more. 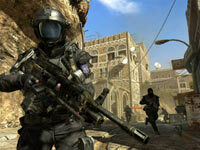 A whole new future war Call of Duty scenario affected by player decisions in mission play. 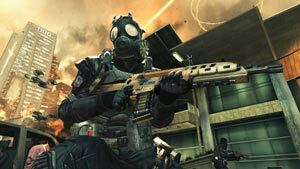 Pushing the boundaries of what fans have come to expect from the record-setting entertainment franchise, Call of Duty®: Black Ops II propels players into a near future, 21st Century Cold War, where technology and weapons have converged to create a new generation of warfare between old and new foes. In this conflict, the mechanized creations of men reign supreme, facing off against each other as their creators stay safe and unconflicted, and in the process grow ever softer. In this scenario an important question will be asked: What happens when enemy steals the keys? To understand such a possible future, you must understand where you have been. Players of Call of Duty®: Black Ops II gain an understanding of this and more through the game's additional timeline set in the late Cold War era of the 1980's. Within the campaign story, which spans these two eras, players will see familiar faces such as Alex Mason, his son David Mason, and Sgt. Frank Woods. Linking these together will be the rise of another player in the conflict, Raul Menendez. The Biggest Zombies Experience to Date: Call of Duty®: Black Ops II Zombies features three different ways to survive the zombie apocalypse. Unravel the mysteries of a dying Earth in Tranzit, fight endless waves of zombies in Survival mode, or compete in the new 4z4 last-human-standing mode, Grief. 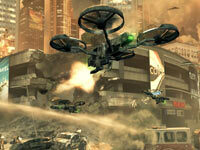 MP Technology with Zombies: Call of Duty®: Black Ops II features new and extensive stat tracking as well as leaderboards for bragging rights. New skill-based matchmaking system will allow players of the same ability to take on the horrors of the night in public game modes. For players that are looking for an extra challenge, Zombies features custom games: Headshots only, higher starting rounds, and toggling of extra items are all available. A variety of multiplayer options.